A self-cleaning spacesuit was developed by engineers using carbon nanotube technology to purge itself from hyper-abrasive space dust. The sharp and sticky particles can cause noteworthy wear and tear on protective gear as well as causing them to overheat. Kavya Manyapu, a flight crew operations and test engineer for Starliner Spacecraft at Boeing, has now created a way to magnetize flexible carbon nanotube fibers which make the fabric immune to the problematic dust particles. A magnetic field induces a process known as electrophoresis, which carries and moves charged particles away from an area to stop it building up in certain areas. However, particles on our moon and other planets are sharper and abrasive because of the atmosphere which erodes bulging edges here on Earth. It is also often electrically charged due to the relentless and unfiltered UV rays from space which experts say make the dust particles ‘sticky’. Static electricity aids the dust cling to a spacesuit and then wears out the fabric – often in crevices and folds such as elbows and knees. Carbon nano-tubes are already in use to stop dust settling on solar panels and other sensors in space but they are brittle and ill-suited for use in clothing. However, scientists have found a way to make technology flexible with the use of small magnetic field created a fabric that can repel the dust. Boeing engineers created a fully functioning knee joint section to prove their concept was operative. The segment was fully pressurized, as it would be on future lunar and Martian missions. It can even be adapted to improved suit the circumstances and requirements of other planets. The cells inside a tumour differ a lot. While some remains “good” and do not cause trouble, others become aggressive and starts to spread to other organ sites. It is very hard to predict which cells become aggressive or not. Nevertheless, by isolating these aggressive cancer cells in in vivotests on animals, Nils Halberg at the Department of Biomedicinet the University of Bergen (UiB) and the researchers Dr. Sohail Tavazoie and Dr. Caitlin Sengelaub at The Rockefeller University have discovered a certain protein (PITPNC1) that characterise aggressive cancer cells. “We discovered that the aggressive cancer cells that are spreading in colon, breast, and skin cancer contained a much higher portion of the protein PITPNC1, than the non-aggressive cancer cells,” says researcher Nils Halberg of the CELLNET Group at the Department of Biomedicine at UiB. The researcher also discovered that this protein, that characterizes the aggressive cancer cells, has got a very specific function in the process of spreading cancer. The cancer cells spread from one place in the body to another, through the blood vessel. To get into the blood vessels, the cell needs to penetrate tissue, both when it leaves the tumour and when it is attaching to a new organ. “The protein PITPNC1 regulates a process whereby the cancer cells are secreting molecules, which cut through a network of proteins outside the cells, like scissors. The cancer cell is then able to penetrate the tissue and set up a colonies at new organ sites,” Halberg explains. A tumour that is not spreading, is usually not dangerous for the patient if it is removed. The hard part in cancer therapy is when the tumour starts to spread. Guided by the new discoveries, supported by the Bergen Research Foundation´s (BFS) Recruitment Programme, Halberg hopes to contribute to a better treatment of cancer patients. “If we get to the point where we can offer a custom-made therapy that targets the function of this protein, we might be able to stop it spreading,” says Nils Halberg. Background: Phosphatidylinositol transfer protein, cytoplasmic 1 (PITPNC1) (alternative name, RdgB) promotes metastatic colonization and angiogenesis in humans. Results: We demonstrate that RdgB is a phosphatidic acid (PA)- and phosphatidylinositol-binding protein and binds PA derived from the phospholipase D pathway. Conclusion: RdgB is the first lipid-binding protein identified that can bind and transfer PA. Enhanced secretion of tumorigenic effector proteins is a feature of malignant cells. The molecular mechanisms underlying this feature are poorly defined. We identify PITPNC1 as a gene amplified in a large fraction of human breast cancer and overexpressed in metastatic breast, melanoma, and colon cancers. Biochemical, molecular, and cell-biological studies reveal that PITPNC1 promotes malignant secretion by binding Golgi-resident PI4P and localizing RAB1B to the Golgi. RAB1B localization to the Golgi allows for the recruitment of GOLPH3, which facilitates Golgi extension and enhanced vesicular release. PITPNC1-mediated vesicular release drives metastasis by increasing the secretion of pro-invasive and pro-angiogenic mediators HTRA1, MMP1, FAM3C, PDGFA, and ADAM10. We establish PITPNC1 as a PI4P-binding protein that enhances vesicular secretion capacity in malignancy. Metastatic cancer cells use nanotubes to manipulate blood vessels. MAKING CONTACT: Breast cancer cells (white arrows) in culture deliver microRNAs to endothelial cells through filamentous nanotubes (yellow arrow). Y. Conner et al., “Physical nanoscale conduit-mediated communication between tumour cells and the endothelium modulates endothelial phenotype,” Nat Commun, 6:8671, 2015. Harvard bioengineer Shiladitya Sengupta and his team were establishing a culture system to model the matrix and blood vessel networks that surround tumors when they found that human breast cancer cells spread out along blood vessel endothelial cells rather than form spheroid tumors as expected. Taking a closer look using scanning electron microscopy, they spied nanoscale filaments consisting of membrane and cytoskeletal components linking the two cell types. These cancer cell–spawned nanotubes, the team discovered, could transfer a dye from cancer cells to endothelial cells both in culture and in a mouse model of breast cancer metastasis to the lungs.The cells also transferred microRNAs known to regulate endothelial cell adhesion and disassociation of tight junctions, which Sengupta speculates may help cancer cells slip in and out of blood vessels. This study is the first to suggest a role for nanotubes in metastasis. Sengupta’s team then used low doses of cytoskeleton-disrupting drugs to block nanotube formation. Emil Lou, an oncologist at the University of Minnesota who studies nanotubes in cancer and was not involved in the study, says this approach is a “good start,” though such drugs would not be used in human patients because they are not specific to nanotubes. Lou says the study emphasizes the importance of understanding interactions between tumors and their surrounding tissues on a molecular level. Going forward, Sengupta plans to study how the tubes are formed in melanoma as well as breast and ovarian cancers to try to identify other drug targets. Metastasis is a major cause of mortality and remains a hurdle in the search for a cure for cancer. Not much is known about metastatic cancer cells and endothelial cross-talk, which occurs at multiple stages during metastasis. Here we report a dynamic regulation of the endothelium by cancer cells through the formation of nanoscale intercellular membrane bridges, which act as physical conduits for transfer of microRNAs. The communication between the tumour cell and the endothelium upregulates markers associated with pathological endothelium, which is reversed by pharmacological inhibition of these nanoscale conduits. These results lead us to define the notion of ‘metastatic hijack’: cancer cell-induced transformation of healthy endothelium into pathological endothelium via horizontal communication through the nanoscale conduits. Pharmacological perturbation of these nanoscale membrane bridges decreases metastatic foci in vivo. Targeting these nanoscale membrane bridges may potentially emerge as a new therapeutic opportunity in the management of metastatic cancer. Metastasis is the culmination of a cascade of events, including invasion and intravasation of tumour cells, survival in circulation, extravasation and metastatic colonization4. Multiple studies have reported a dynamic interaction between the metastatic tumour cell and the target organ, mediated by cytokines4, 12 or by exosomes that can prime metastasis by creating a pre-metastatic niche13. Interestingly, the interactions between cancer cells and endothelium in the context of metastasis, which occurs during intravasation, circulation and extravasation, remains less studied. Cancer cell-secreted soluble factors can induce retraction of endothelial cells and the subsequent attachment and transmigration of tumour cells through the endothelial monolayers14, 15. Recently, studies indicate a more intricate communication between cancer cells and the endothelium. For example, a miRNA regulon was found to mediate endothelial recruitment and metastasis by cancer cells16. Similarly, exosome-mediated transfer of cancer-secreted miR-105 was recently reported to disrupt the endothelial barrier and promote metastasis17. We rationalized that a better understanding of cancer–endothelial intercellular communication, primarily during extravasation, could lead to novel strategies for inhibiting metastasis18. Recently, nanoscale membrane bridges, such as tunnelling nanotubes (TNTs) and filopodias, have emerged as a novel mechanism of intercellular communication19. For example, specialized signalling filopodia or cytonemes were recently shown to transport morphogens during development20. Similarly, TNTs, which unlike filopodia have no contact with the substratum21, were shown to facilitate HIV-1 transmission between T cells, enable the spread of calcium-mediated signal between cells and transfer p-glycoproteins conferring multi-drug resistance between cancer cells22, 23, 24, 25. TNTs were also recently implicated in trafficking of mitochondria from endothelial to cancer cells and transfer miRNA between osteosarcoma cells and stromal murine osteoblast cells, and between smooth muscle cells and the endothelium26, 27, 28. However, whether similar intercellular nanostructure-mediated communication can be harnessed by cancer cells to modulate the endothelium is not known. Here we report that metastatic cancer cells preferentially form nanoscale intercellular membrane bridges with endothelial cells. These nanoscale bridges act as physical conduits through which the cancer cells can horizontally transfer miRNA to the endothelium. We observe that the recipient endothelial cells present an miRNA profile that is distinct from non-recipient endothelial cells isolated from the same microenvironment. Furthermore, the co-cultures of cancer and endothelial cells upregulate markers associated with pathological endothelium, which is inhibited by pharmacological disruption of the nanoscale conduits. Additionally, the pharmacological inhibitors of these nanoscale conduits can decrease metastatic foci in vivo, which suggests that these nanoscale conduits may potentially emerge as new targets in the management of metastatic cancer. (a) Representative image of MDA-MB-231 cancer cells exhibiting an invasive phenotype in the presence of preformed endothelial tubes in co-culture. (b) Representative image of a mammosphere typically formed by MDA-MB-231 cells when cultured on 3D tumour matrix in the absence of endothelial cells. MDA-MB-231 cells were loaded with CFSE. Actin was labelled with rhodamine phalloidin and nuclei were counterstained with DAPI. (c) A representative SEM of epithelial (EPI) MDA-MB-231 cells aligning on HUVEC (ENDO) tubules in the co-culture. Lower panel shows higher magnification. (d) SEM image reveals nanoscale membrane bridges connecting (nCs) metastatic breast cancer (EPI) cells and endothelial vessels (arrows). (e) A representative transmission electron micrograph shows intercellular connectivity through the nanoscale membrane bridge between MDA-MB-231 and an endothelial cell. (f) A cartoon represents the types of homotypic and heterotypic intercellular nanoscale connections that an epithelial cell may form in the presence of endothelial tubules. Highly metastatic (MDA-MB-468, MDA-MB-231 or MDA-MB-435) or low metastatic (MCF7 and SkBr3) cancer cells were co-cultured with the endothelial tubes. Normal HMECs were used as control. Graphs show percentage of total population of epithelial cells that exhibit either homotyptic (Epi–Epi) or heterotypic (Epi–Endo) nanoscale connections and (g) average number of nanoscale connections formed per cell. Quantification analysis was done on >300 cells of each cell type. Data shown are mean±s.e.m. (n=6 replicates per study, with 2–3 independent experiments). **P<0.01, ***P<0.001 (analysis of variance followed by Bonferroni’s post-hoctest). Figure 3: Structure and function of the heterotypic intercellular nanoscale membrane bridges. a) Representative images show the heterotypic nanoscale membrane bridges are composed of both F-actin and α/β-tubulin cytoskeletal components. Co-cultures were stained with α/β-tubulin antibody (green) and phalloidin (purple) to label actin, and counterstained with DAPI (nuclear)+WGA (plasma membrane) (blue). Endothelial cells were labelled with DiL-Ac-LDL (red). (b) Mathematical modelling of the structure of the nanoscale connections. The physical properties of actin filaments necessitate microtubules for projections of certain length scales. The maximum projection length for a given minimum diameter at the buckling limit is plotted for actin-only nanoscale structures (purple line). This curve is overlaid with the experimental length and diameter measurements (red dots) from the observed thin projections measured in these studies. Projections containing only actin or projections containing both actin and tubulin can exist to the right of the curve (purple line). However, actin-only projections cannot exist to the left of the curve (green region). (c) The effect of incorporating tubulin in these projections. The maximum length is plotted against the minimum diameter for varying fractions of tubulin incorporated in the nanoscale projection. Addition of microtubules to the projections increases the overall flexural rigidity, shifting the curves left of the actin-only limit (purple line), thus allowing for longer and thinner nanoscale connections. However, owing to the larger radius of microtubules (4 × radius of actin filaments), there is an optimal fraction of tubulin (green line) that can be incorporated into the projection before the effect is reversed. (d) The optimal fraction of microtubules is about 6.6% (red dashed line) to maximize nanostructure flexural strength, while minimizing thickness. (e) Representative confocal image shows the presence of myosin V motor proteins within the intercellular nanostructure (inset shows higher magnification). Scale bar 10 μm. Figure 4: The nanoscale membrane bridges act as conduits for intercellular communication between cancer and endothelial cells. (a) Confocal image of nanoscale membrane bridge-mediated transfer of cytoplasmic contents. CFSE (green)-loaded MDA-MB-231 cells were co-cultured with the Dil-Ac-LDL (red)-labelled HUVECs. Transfer of the CFSE dye was observed after 24-h co-culture. CFSE dye can be seen within HUVEC cells (yellow arrow). Tumour cells can form a nanobridge with a distal endothelial cell (EC1) than an endothelial cell (EC2) in close proximity. (b,c) Cartoon shows the experimental design, where dual cultures control for vesicle-mediated intercellular transfer. FACS plot show gating for sorting endothelial cells from the co-cultures using dual staining for DiI-Ac-LDL and PECAM-1, and then quantification for CFSE transfer in the isolated endothelial cells. (d) Graph shows quantification of FACS analysis, highlighting increased transfer of CFSE to endothelial cells in the co-culture. (N>100,000 events, n=36 replicates, 3 replicates per study). (e) Graph shows the temporal kinetics of nanoscale connection-mediated intercellular transfer of CFSE from MDA-MB-231 cells to the endothelium (n=2 studies, 3 replicates per study). (f) Effect of small molecule inhibitors of cytoskeletal components on membrane nanobridges. (g) Graphs show treatment with vehicle (control) or a low-dose combination of docetaxel and cytochalasin do not affect the exosome shedding (n=2 independent studies). (h,i) Graphs show the effect of pharmacological inhibitors on the formation of heterotypic and homotypic nanoscale bridges (arrows). (n=2 studies, 6 replicates per study). (j) Graph shows the effect of pharmacological inhibitors on intercellular transfer of CFSE to endothelial cells from cancer cells (n=10 studies, 3 replicates per study). Data shown are mean±s.e.m. (*P<0.05,**P<0.01, ****P<0.001, analysis of variance followed by Bonferroni’s post-hoc test). Figure 5: The nanoscale membrane bridges act as conduits for intercellular transfer of miRNA between cancer and endothelial cells. Representative confocal images show the transfer of Cy3-labelled miRNA from MDA-MB-231 cells (EPI) to endothelial cells (ENDO) at (a) 24 h and (b) 36 h of co-culture. Alexa Fluor 488-Ac-LDL (green)-labelled endothelial cells were co-cultured with Cy3-labelled miRNA-transfected MDA-MB-231. Co-cultures were counterstained with phalloidin (purple) and DAPI+WGA (blue). A 3D visualization shows the localization of miRNA within the nanoscale connections (white arrows), which act as conduits for horizontal transfer of miRNAs to endothelial cells. (c) Schema shows quantification of Cy3-labelled control miRNA and Cy3-labelled miR132 transfer between cancer cell and endothelium using flow cytometry. Endothelial cell populations were isolated from the co-cultures and percentage of miRNA+ve cells was determined. Dual cultures in Boyden chambers were included as controls. (d) Graph shows the effect of pharmacological disruption of nanoscale conduits on miRNA transfer. (e) Schema shows experimental design for reverse transcriptase–PCR-based detection of transferred miR-132 in endothelial cells under different experimental conditions. MDA-MB-231 cells transfected with miR-132 and α-miR-132 were co-cultured with endothelial tubes. FACS-isolated endothelial cell populations were analysed for the expression of miR-132. (f) Graph shows miR-132+ve cell populations (solid red) show 5 × increase compared with miR-132−ve populations (solid blue) (P<0.0001), whereas anti-miR-132+ve cells (striped red) show 26 × decrease in miR-132 expression (P<0.0001) compared with α-miR-132−ve cells (striped blue). Direct transfection of miR-132 (black) and α-miR-132 (light blue) in endothelial cells is used as positive and negative controls, respectively. Upregulation of miR-132 from baseline was observed in dual culture (solid green), which could be inhibited with anti-miR-132 (striped green). MiR-132 levels are increased compared with dual only in those cells that are positive for intercellular transfer. Fold change was determined compared with endothelial cell transfection with control miRNA (grey). (g) FACS analysis shows nanoscale bridges-mediated transfer of miRNAs leads to changes in p120RasGAP and pAkt (S473) expression downstream of the miR-132 pathway in endothelial cell populations isolated from co-cultures. (h) Graphs show p120RasGAP expression is decreased in the miR-132+ve cell populations and increased in the α-miR-132+ve cell populations, while further downstream miR-132 positively regulates pAkt expression. Data shown are mean±s.e.m. (N=2–5 independent studies, with 3 replicates per study,*P<0.05, **P<0.01, ***P<0.001, ****P<0.0001, analysis of variance followed by Bonferroni’s post-hoctest). Figure 6: Cancer cell–endothelial intercellular transfer alters the endogenous miRNA profile and phenotype of recipient endothelial cells. The complexity of regulatory tumour parenchyma–endothelial communication is increasingly being unravelled7, 50. The altered phenotypic behaviour of the metastatic cancer cells in the presence of endothelial cells observed in this study, instead of forming classical mammospheres, is consistent with the emerging paradigm of modulatory tumour parenchyma–stroma communication and the creation of a pre-metastatic niche. Indeed, a recent study proposed the concept of the formation of a pre-metastatic niche mediated via metastatic cell-secreted exosomes, leading to vascular leakiness at the pre-metastatic sites13. Here we demonstrate that cancer cells form nanoscale membrane bridges, which can act as conduits for horizontal transfer of miRNA from the cancer cells to the endothelium, switching the latter to a pathological phenotype. Our findings reveal that the ability to form the nanoscale conduits with endothelial cells correlates with the metastatic potential of the cancer cell, and that the pharmacological perturbation of these nanoscale connections can lead to a reduction in the metastatic burden in experimental metastasis models. Together, our studies shed new insights into the tumour parenchyma–endothelial communication, adding depth to the emerging paradigm of the ability of a cancer cell to ‘hijack’ a physiological stromal cell for self-gain13. Indeed, exosomes have emerged as an extensively studied mechanism of horizontal intercellular transfer of information51. However, a key distinction exists between the exosome-mediated versus the nanoscale membrane bridge-mediated intercellular communication. Although the former is stochastic, that is, it is unlikely the cancer cell has control over which cell will be targeted by a secreted exosome, the communication via nanoscale membrane bridges is deterministic, that is, the cancer cell can connect to a specific endothelial cell, which could be further away than the most proximal endothelial cell. Although the aim of this study was to study the nanoscale membrane bridges as a mode of horizontal transfer of miRNAs from the metastatic cancer cells to the endothelium, and not to characterize a specific miRNA that are implicated in metastasis, many of the miRNAs, which were differentially regulated in the recipient endothelial cells, have previously been shown to regulate metastasis (Supplementary Discussion). Bone disorders are of significant concern due to increase in the median age of our population and at this present time bone grafts have are used to restore damaged bone. However, synthetic biomaterials are now being used as bone graft substitutes and they are selected for structural restoration based on their biomechanical properties. Lately, scaffolds are engineered to be bioactive to enhance tissue growth. These scaffolds are usually porous, made of biodegradable factors, drugs or stem cells. The research group led by Dr. Maria Vallet-Regi at Faculty of Pharmacy-Universidad Complutense de Madrid showed that carbon nanotubes to the mix to create 3D electrical network within the bone tissue can stimulate bone cell regrowth. The polymer they used was polycarpolactone (PCL), which is rather easy to 3D print. According to Mercedes Vila, the Principal Investigator in charge of the project, the carbon nanotubes were added to the bio-printable material mixture to create a three-dimensional electrical conducting network all through the volume of the scaffold, which would allow the application of this stimulation to the scaffold once implanted on the damaged bone site. Adding CNTs into the bio-printed polymer and mineral prosthetic bone can stimulate regrowth of the actual bone cells. However, bio-printing CNTs created no extra difficulties, as they are so thin that they can be extruded with ease through any pneumatic syringe. Most of the complications are related to finding the correct viscosity in the combination of CPL and hydroxypatite. Using EnvisionTEC’s 3D bioplotter, the researchers were able to create very complex 3D structures which would enhance the future for tissue replacements as it allows tailored solutions by capturing the anatomical information of the patient’s wound by computed tomography and magnetic resonance, for example, to obtain a personalized and unique implant. As with many other 3D printing applications, it appears we are only starting to scratch the surface of the possibilities that are ahead for bioprinting. Artificially intelligent synthetic skin interacts with brain cells. Currently, the traditional ways of dealing with large losses of skin is to use skin grafts from the patient or from an unrelated donor or cadaver. The medical community has been looking for an alternative in dealing with large losses of skin. The researchers at Stanford University State created an artificial skin that can detect how hard is being pressed and produce an electric signal to deliver this sensory input directly to a living brain cell. To understand the pressure sensing capability electronically, the team dispersed billions of carbon nano tubes through waffled plastic which shows that the two-ply construct allows it to mimic human skin which transmits pressure information as short pulses of electricity to the skin. The results show that increasing the pressure on the waffled nanotubes, which allows more electricity to flow through the sensor and send short pulses to the sensing mechanism. However, when pressure is removed the flow relaxes which indicates light touch, but when the pressure and pulses are removed there is no sensation. The study added a layer of artificial skin to cover the pressure sensing mechanism. Results indicate that the top layer creates a sensing mechanism and the bottom layer acts as a circuit to transport electric signals and translate them into the biochemical stimuli compatible with nerve cells. The team concluded that there are six types of biological sensing mechanisms in the human hand, and their experiment reports success in just one of them. Annual treatment costs for musculoskeletal diseases in the US are roughly 7.7% (~ $849 billion) of total gross domestic product. Such disorders are the main cause of physical disability in US (I). The challenges of drug delivery for bone regeneration and reconstruction has been previously reported here by Dr. Aviral Vatsa (I-IV), herein, we will discussed the different needs for bone regeneration and the potential use if nanotechnology. Bone regeneration is a complex, well-orchestrated physiological process of bone formation, which can be seen during normal fracture healing, and is involved in continuous remodelling throughout adult life. However, there are complex clinical conditions in which bone regeneration is required in large quantity, such as for skeletal reconstruction of large bone defects created by trauma, infection, tumour resection and skeletal abnormalities, or cases in which the regenerative process is compromised, including avascular necrosis, atrophic non-unions and osteoporosis (1,2). Regenerative medicine offers a way to improve ‘local’ strategies in terms of tissue engineering and gene therapy, or even ‘systemic’ enhancement of bone repair. To make regenerative medicine successful, three elements are required: stem cells, scaffolds, and growth factors (3). At the remodeling sites, osteoblasts produce new bone, while osteoclasts resorb existing bone. Each cell type seems to be regulated by a variety of hormones and by local factors. If the balance between bone formation and resorption is lost by uncontrolled production of these regulators, the bone structure will be damaged, and the subject would be susceptible to osteoporosis and osteopetrosis (2). Standard approaches widely used in clinical practice to stimulate or augment bone regeneration include distraction osteogenesis and bone transport. Allografts – obtained from human cadavers or living donors, which bypasses the problems associated with harvesting and quantity of graft material. Allogeneic bone is available in many preparations, including demineralised bone matrix (DBM), morcellised and cancellous chips, corticocancellous and cortical grafts, and osteochondral and whole-bone segments, depending on the recipient site requirements. Bone-graft substitutes or growth factors – developed as alternatives to autologous or allogeneic bone grafts. They consist of scaffolds made of synthetic or natural biomaterials that promote the migration, proliferation and differentiation of bone cells for bone regeneration. Commonly performed surgical procedure to augment bone regeneration in a variety of orthopaedic and maxillofacial procedures. The Masquelet technique is a two-step procedure for bone regeneration and reconstruction of long-bone defects. It is based on the concept of a “biological” membrane, which is induced after application of a cement spacer at the first stage and acts as a ‘chamber’ for the insertion of non-vascularised autograft at the second stage (2, 4). There are non-invasive methods of biophysical stimulation, such as low-intensity pulsed ultrasound (LIPUS) and pulsed electromagnetic fields (PEMF) (1). Limitations of Current approaches: Most of the current strategies for bone regeneration exhibit relatively satisfactory results. However, there are associated drawbacks and limitations to their use and availability, and even controversial reports about their efficacy and cost-effectiveness. New methods for studying this process, such as quantitative three-dimensional microcomputed tomography analyses, finite element modelling, and nanotechnology have been developed to further evaluate the mechanical properties of bone regenerate at the microscopic level. Here are some examples of the latest developments as reviewed by Dimitriou R at el (1). BMPs and growth factors – They induce the mitogenesis of mesenchymal stem cells (MSCs) and other osteoprogenitors, and their differentiation towards osteoblasts. BMP-2 and BMP-7 have been licensed for clinical use since 2002 and 2001 respectively (5). These two molecules have been used in a variety of clinical conditions including non-union, open fractures, joint fusions, aseptic bone necrosis and critical bone defects. 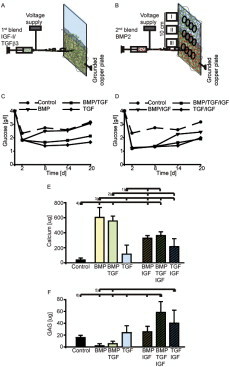 Platelet-derived growth factor (PDFG), transforming growth factor-β (TGF-b), insulin-like growth factor-1 (IGF-1), vascular endothelial growth factor (VEGF) and fibroblast growth factor (FGF) have been also implicated in bone regeneration, with different functions in terms of cell proliferation, chemotaxis and angiogenesis. One current approach to enhance bone regeneration and soft-tissue healing by is local application of growth factors is the use of platelet-rich plasma alongside the autograph. BMPs are also being used in bone-tissue engineering. MSCs – The current approach of delivering osteogenic cells directly to the regeneration site includes use of bone-marrow aspirate from the iliac crest, which also contains growth factors. It is a minimally invasive procedure to enhance bone repair, and produces satisfactory results (1). Overall, however, there are significant ongoing issues with quality control with respect to delivering the requisite number of MSCs/osteoprogenitors to effect adequate repair responses. Issues of quantity and alternative sources of MSCs are being extensively investigated. Novel approaches in terms of cell harvesting, in vitro expansion and subsequent implantation are promising. Scaffolds and Bone substitutes – synthetic bone substitutes and biomaterials are already widely used in clinical practice for osteoconduction. DBM (Demineralized bone matrix) and collagen are biomaterials, used mainly as bone-graft extenders, as they provide minimal structural support. A large number of synthetic bone substitutes are currently available, such as HA, β-TCP and calcium-phosphate cements, and glass ceramics. These are being used as adjuncts or alternatives to autologous bone grafts. Especially for regeneration of large bone defects, where the requirements for grafting material are substantial, these synthetics can be used in combination with autologous bone graft, growth factors or cells (6). Improved biodegradable and bioactive three-dimensional porous scaffolds are being investigated, as well as novel approaches using nanotechnology, such as magnetic biohybrid porous scaffolds acting as a crosslinking agent for collagen for bone regeneration guided by an external magnetic field or injectable scaffolds for easier application. Tissue Engineering – The tissue-engineering approach is a promising strategy added in the field of bone regenerative medicine, which aims to generate new, cell-driven, functional tissues, rather than just to implant non-living scaffolds. In essence, bone-tissue engineering combines progenitor cells, such as MSCs (native or expanded) or mature cells (for osteogenesis) seeded in biocompatible scaffolds and ideally in three-dimensional tissue-like structures (for osteoconduction and vascular ingrowth), with appropriate growth factors (for osteoinduction), in order to generate and maintain bone (7). Bone-tissue engineering is in its early stages, and there are many issues of efficacy, safety and cost to be addressed before general clinical application can be achieved. Gene Therapy – This involves the transfer of genetic material into the genome of the target cell, allowing expression of bioactive factors from the cells themselves for a prolonged time. Gene transfer can be performed using a viral (transfection) or a non-viral (transduction) vector, and by either an in vivo or ex vivo gene-transfer strategy. There are issues of cost, efficacy and biological safety that need to be answered. Nanotechnology has been greatly utilized for bone tissue engineering strategies. It has been employed to overcome some of the current limitations associated with bone regeneration methods including insufficient mechanical strength of scaffold materials, ineffective cell growth and osteogenic differentiation at the defect site, as well as unstable and insufficient production of growth factors to stimulate bone cell growth (8,9). To mimic the natural bone nanocomposite architecture, novel biomaterials and nanofabrication techniques are currently being employed and many different nanostructures have already been designed and tested. Electrospinning has been extensively applied to create bone nanofiber scaffolds and biomaterials typically used for this purpose, including synthetic organic polymers such as PCL, PLGA, PLLA, Chitosan, and silk fibroin. Among the materials used for bone-reconstruction, PLLA is a biocompatible polymer with the advantage of being highly. biodegradable. For this reason, PLLA have received the approval of the Food and Drug Administration (FDA) to be use in bone reconstructive surgery (10). PLLA nanofibers are often functionalized to improve their biological performance with peptides such as RGD (Arg-Gly-Asp); with osteogenic molecules such as hydroxyapatite; or with proteins such as collagen and the growth factor bone morphogenic protein 2 (BMP-2). It was found that direct incorporation of BMP-2 into PLLA nanofibers enhances the osteoinductivity of the scaffolds. Current orthopedic implants fail in an appropriate osteo-integration limiting implant lifespan. Titanium, as a biocompatible material, has been used to enhance implant incorporation in bone for dental, craniofacial, and orthopedic applications. Studies have demonstrated that nanoporous titanium dioxide (TiO2) surface modification alters nanoscale topography improving soft tissue attachment on titanium implants surface (11). 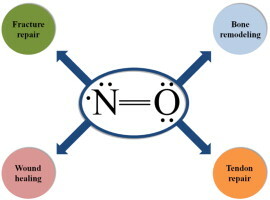 For example, the uses of nanoporous TiO2 surface-modified implants, in a human dental clinical study, showed that TiO2 thin film increased adherence in early healing of the human oral mucosa and reduced marginal bone resorption (11). Another example are rosette nanotubes. Bioactive helical rosette nanotubes are self-assembled nanomaterials, formed in water from synthetic DNA base analogs that mimic the helical nanostructure of collagen in bone. This technology has been used to create a biomimetic nanocomposite combined with nanocrystalline hydroxyapatite, and biocompatible hydrogels which increased osteoblast adhesion. Carbon nanotubes (CNTs) are other suitable scaffold materials that have proved to support osteoblast proliferation. CNTs possess exceptional mechanical, thermal, and electrical properties, facilitating their use as reinforcements or, in combination with other biomaterials, to improve and to support bone growth. Clinical therapies implying the use of nanotechnology in bone regeneration are still in the beginning stages. BDSint – Recently, the bone healing ability of a nanocomposite (DBSint®), approved for clinical use, constituted by biomimetic nanostructured Mg-hydroxyapatite and human demineralized bone matrix has been investigated. The clinical-radiographic and histomorphometry study in subjects undergoing high tibial osteotomy, demonstrated that these nanocomposites are safe and effective. Yet the long term outcome is still to be defined (8, 12). BioOsss and BioGides – Schwarz et al. undertook a four-year study of patients treated of moderate intrabony peri-implantitis defects using either a nanocrystalline hydroxyapatite or a natural bone mineral (BioOsss spongiosa granules) in combination with a collagen membrane (BioGides) and found bone reconstruction (8, 13). NCT00729716 – Comparison of BioCart™II With Microfracture for Treatment of Cartilage Defects of the Femoral Condyle BioCart™II scaffold Cartilage ————Phase 2. The advantages of nanomaterials as therapeutic and diagnostic tools are vast, due to design flexibility, small sizes, large surface-to-volume ratio, and ease of surface modification. The potential of these bio-devices has shown promising results in vitro, and some of them have also been successfully tested in vivo with animal models. Nevertheless, the gap between laboratory and medical application of these nanotechnological advances is still wide (8). Although some successful devises have already being tested in clinical trials and the data produced by these studies is highly encouraging, the safety of nanomedicine is not yet fully defined and more clinical studies still need to be conducted to translate nanotechnological devices to the clinic. Annual treatment costs for musculoskeletal diseases in the US are roughly 7.7% (~ $849 billion) of total gross domestic product. Such disorders are the main cause of physical disability in US. Almost half of all chronic conditions in people can be attributed to bone and joint disorders. In addition there is increasing ageing population and associated increases in osteoporosis and other diseases, rising incidences of degenerative intervertebral disk diseases and numbers of revision orthopedic arthroplasty surgeries, and increases in spinal fusions. All these factors contribute towards the increasing requirement of bone regeneration and reconstruction methods and products. Delivery of therapeutic grade products to bone has various challenges. Parenteral administration limits the efficient delivery of drugs to the required site of injury and local delivery methods are often expensive and invasive. The theme issue of Advance Drug Delivery reviews focuses on the current status of drug delivery to bone and the issues facing this field. Here is the first part of these reviews and research articles. Demineralized bone matrix (DBM) is an osteoconductive and osteoinductive commercial biomaterial and approved medical device used in bone defects with a long track record of clinical use in diverse forms. True to its name and as an acid-extracted organic matrix from human bone sources, DBM retains much of the proteinaceous components native to bone, with small amounts of calcium-based solids, inorganic phosphates and some trace cell debris. Many of DBM’s proteinaceous components (e.g., growth factors) are known to be potent osteogenic agents. Commercially sourced as putty, paste, sheets and flexible pieces, DBM provides a degradable matrix facilitating endogenous release of these compounds to the bone wound sites where it is surgically placed to fill bone defects, inducing new bone formation and accelerating healing. Given DBM’s long clinical track record and commercial accessibility in standard forms and sources, opportunities to further develop and validate DBM as a versatile bone biomaterial in orthopedic repair and regenerative medicine contexts are attractive. The regeneration of large bone defects caused by trauma or disease remains a significant clinical problem. Although osteoinductive growth factors such as bone morphogenetic proteins have entered clinics, transplantation of autologous bone remains the gold standard to treat bone defects. The effective treatment of bone defects by protein therapeutics in humans requires quantities that exceed the physiological doses by several orders of magnitude. This not only results in very high treatment costs but also bears considerable risks for adverse side effects. These issues have motivated the development of biomaterials technologies allowing to better control biomolecule delivery from the solid phase. Here we review recent approaches to immobilize biomolecules by affinity binding or by covalent grafting to biomaterial matrices. We focus on biomaterials concepts that are inspired by extracellular matrix (ECM) biology and in particular the dynamic interaction of growth factors with the ECM. We highlight the value of synthetic, ECM-mimicking matrices for future technologies to study bone biology and develop the next generation of ‘smart’ implants. Calcium phosphate cements are used as synthetic bone grafts, with several advantages, such as their osteoconductivity and injectability. Moreover, their low-temperature setting reaction and intrinsic porosity allow for the incorporation of drugs and active principles in the material. It is the aim of the present work to: a) provide an overview of the different approaches taken in the application of calcium phosphate cements for drug delivery in the skeletal system, and b) identify the most significant achievements. The drugs or active principles associated to calcium phosphate cements are classified in three groups, i) low molecular weight drugs; ii) high molecular weight biomolecules; and iii) ions. Silk fibroin (SF) is a biopolymer with distinguishing features from many other bio- as well as synthetic polymers. From a biomechanical and drug delivery perspective, SF combines remarkable versatility for scaffolding (solid implants, hydrogels, threads, solutions), with advanced mechanical properties and good stabilization and controlled delivery of entrapped protein and small molecule drugs, respectively. It is this combination of mechanical and pharmaceutical features which renders SF so exciting for biomedical applications. This pattern along with the versatility of this biopolymer has been translated into progress for musculoskeletal applications. We review the use and potential of silk fibroin for systemic and localized delivery of therapeutics in diseases affecting the musculoskeletal system. We also present future directions for this biopolymer as well as the necessary research and development steps for their achievement. As a unique human bone extract approved for implant use, demineralized bone matrix (DBM) retains substantial amounts of endogenous osteoconductive and osteoinductive proteins. Commercial preparations of DBM represent a clinically accessible, familiar, widely used and degradable bone-filling device, available in composite solid, strip/piece, and semi-solid paste forms. Surgically placed and/or injected, DBM releases its constituent compounds to bone sites with some evidence for inducing new bone formation and accelerating healing. Significantly, DBM also has preclinical history as a drug carrier by direct loading and delivery of several important classes of therapeutics. Exogenous bioactive agents, including small molecule drugs, protein and peptide drugs, nucleic acid drugs and transgenes and therapeutic cells have been formulated within DBM and released to bone sites to enhance DBM’s intrinsic biological activity. Local release of these agents from DBM directly to surgical sites in bone provides improved control of dosing and targeting of both endogenous and exogenous bioactivity in the context of bone healing using a clinically familiar product. Given DBM’s long clinical track record and commercial accessibility in standard forms and sources, opportunities to formulate DBM as a versatile matrix to deliver therapeutic agents locally to bone sites in orthopedic repair and regenerative medicine contexts are attractive. Biodegradable nanofibers are important scaffolding materials for bone regeneration. In this paper, the basic concepts and recent advances of self-assembly, electrospinning and thermally induced phase separation techniques that are widely used to generate nanofibrous scaffolds are reviewed. In addition, surface functionalization and bioactive factor delivery within these nanofibrous scaffolds to enhance bone regeneration are also discussed. Moreover, recent progresses in applying these nanofiber-based scaffolds to deliver stem cells for bone regeneration are presented. Along with the significant advances, challenges and obstacles in the field as well as the future perspective are discussed. Bone is one of the few tissues in the human body with high endogenous healing capacity. However, failure of the healing process presents a significant clinical challenge; it is a tremendous burden for the individual and has related health and economic consequences. To overcome such healing deficits, various concepts for a local drug delivery to bone have been developed during the last decades. However, in many cases these concepts do not meet the specific requirements of either surgeons who must use these strategies or individual patients who might benefit from them. We describe currently available methods for local drug delivery and their limitations in therapy. Various solutions for drug delivery to bone focusing on clinical applications and intra-operative constraints are discussed and drug delivery by implant coating is highlighted. 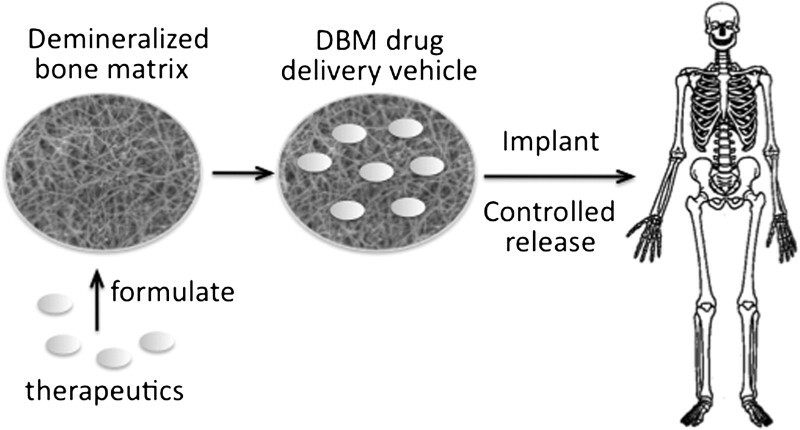 Finally, a new set of design and performance requirements for intra-operatively customized implant coatings for controlled drug delivery is proposed. In the future, these requirements may improve approaches for local and intra-operative treatment of patients. Current state of the art reconstruction of bony defects in the craniomaxillofacial (CMF) area involves transplantation of autogenous or allogenous bone grafts. However, the inherent drawbacks of this approach strongly urge clinicians and researchers to explore alternative treatment options. Currently, a wide interest exists in local delivery of biomolecules from synthetic biomaterials for CMF bone regeneration, in which small biomolecules are rapidly emerging in recent years as an interesting adjunct for upgrading the clinical treatment of CMF bone regeneration under compromised healing conditions. 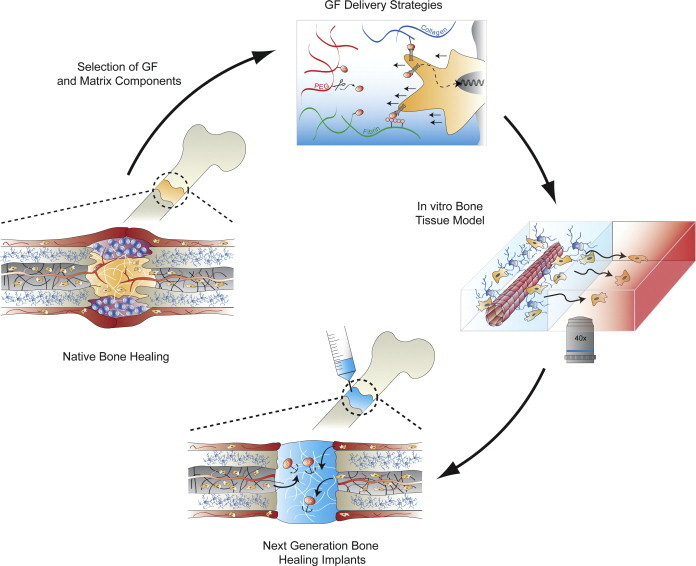 This review highlights recent advances in the local delivery small and large biomolecules for the clinical treatment of CMF bone defects. Further, it provides a perspective on the efficacy of biomolecule delivery in CMF bone regeneration by reviewing presently available reports of pre-clinical studies using various animal models. Many surgical procedures require the placement of an inert or tissue-derived implant deep within the body cavity. While the majority of these implants do not become colonized by bacteria, a small percentage develops a biofilm layer that harbors invasive microorganisms. In orthopaedic surgery, unresolved periprosthetic infections can lead to implant loosening, arthrodeses, amputations and sometimes death. The focus of this review is to describe development of an implant in which an antibiotic tethered to the metal surface is used to prevent bacterial colonization and biofilm formation. Building on well-established chemical syntheses, studies show that antibiotics can be linked to titanium through a self-assembled monolayer of siloxy amines. The stable metal–antibiotic construct resists bacterial colonization and biofilm formation while remaining amenable to osteoblastic cell adhesion and maturation. In an animal model, the antibiotic modified implant resists challenges by bacteria that are commonly present in periprosthetic infections. While the long-term efficacy and stability is still to be established, ongoing studies support the view that this novel type of bioactive surface has a real potential to mitigate or prevent the devastating consequences of orthopaedic infection. Non-invasive treatment of injuries and disorders affecting bone and connective tissue remains a significant challenge facing the medical community. A treatment route that has recently been proposed is nitric oxide (NO) therapy. Nitric oxide plays several important roles in physiology with many conditions lacking adequate levels of NO. As NO is a radical, localized delivery via NO donors is essential to promoting biological activity. Herein, we review current literature related to therapeutic NO delivery in the treatment of bone, skin and tendon repair.